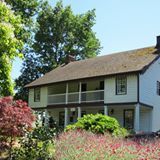 The William L. Holmes House is one of the oldest American homes in Oregon. Joseph Lane gave his inaugural address from its balcony. Open Fridays and Saturdays, 12pm-4pm. 536 Holmes Lane, Oregon City. 503.656.5146.